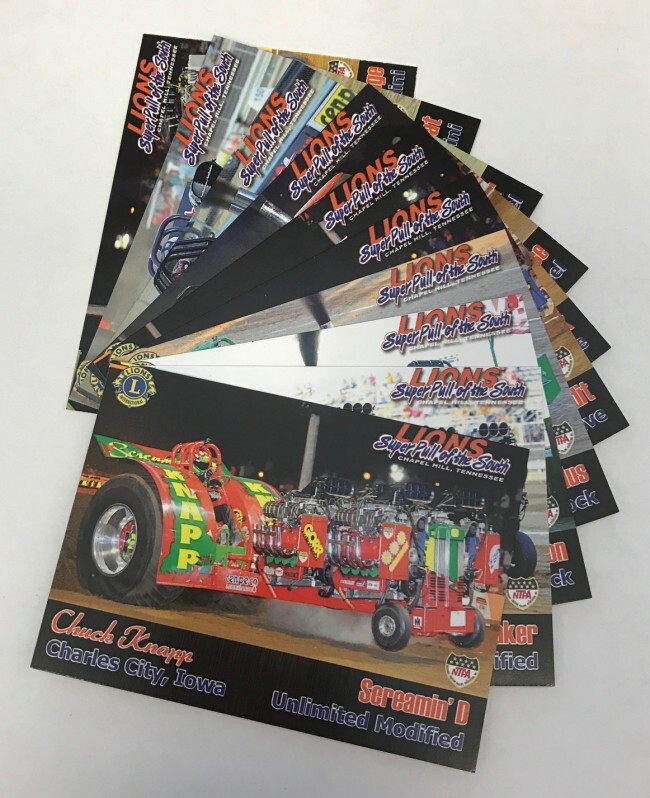 The Lions Super Pull of the South remembers its past winners and stars through these limited edition trading cards. Each pack contains 10 cards, featuring color photos and a bio of each competitor. The 2016 cards include: Chuck Knapp (Screamin' D/UNL), Bret Berg (LG Seeds Money Maker/UNL), Darin Hunt (D2-Pro Stock Edition/PS), Robby Lemke (New Generation Plus/PS), Tyler Cobb (Bandit/FWD), Ted Skelton (The Rock/FWD), Blagraves (Red Horse/SSD), Travis Schlabach (Bone Twister/SSD), Terry Jostock (Wild Cat/MINI), and Chris Martin (LG Seeds Small Change/MINI). Each set comes in a hard, plastic case.